This might not be true for the game of cricket (where nothing can be said till the last bowl is bowled) but it surely holds true when it comes to presentations. The fate of your presentation depends on how well you prepare for it. This post is all about preparing the content of your presentation. This stage as 'the Planning stage' of your presentation. As you read the next paragraphs think of the last important presentation you made. How did you prepare then and how you could have done better? Avoid planning your presentation directly in PowerPoint. It will kill time and will never help you plan out the flow well. When I started out as a presenter I used to boast that I get ideas when I sit before the PowerPoint. Later I realized that a whiteboard is more useful for planning. It gives you the big picture and allows greater clarity. Some people use pen and paper for planning. Planning this way might run into multiple pages, hence it is better to use a whiteboard. In its absence you may use a paper. Divide the whiteboard vertically into two areas. The 25% of area on the left is for 'Input' and the remaining is for the 'Output'. It is the Output that we are interested in. That is what you will put on the slides. Input items will be your guide when you are planning. What action should the audience take post your presentation? The reason I suggest you write these down is that you will not forget them. When you want to edit (or trim) your presentation these input anchors will help you determine what to retain and what to chop off. You start writing down these key headers as your output items. These are the things you want to talk about. You need not write down the answers to these questions on the whiteboard. The answers will be typed on the slides directly. It is the logical flow and the overall clarity which we get from planning on the whiteboard. Don't fill it with unnecessary text. It does not mean you keep the board clean. Fill it with arrows, circles, boxes, stars. Use a variety of colors and make the process of planning enjoyable. Preferably plan along with a friend/colleague. You get ideas when you talk to someone. If you are alone, talk aloud to yourself and fill the whiteboard. 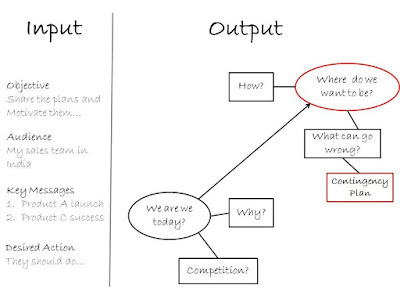 Try out this Input-Output method of planning when you are going to make your next important presentation. Half an hour spent here can saves two hours on the PowerPoint. Remember, 'well begun is half done'. Do you like this method? Leave a comment. Try it out the next time you are presenting? Leave a comment to clarify any doubts? the other day we had a surprise Meeting where our target audience where few IAS officials and They dont have much time and the presentation i am carrying is Quite Big(40 slided one).. I struggled a lot to complete the presentation. After that decided to have a 5 Minuit presentation. And with the Above inputs i guess i can come up with a decent one. If you are looking at reducing a 40 min presentation down to 5 minutes, remember to reduce it down to its core. But be careful not to make the presentation too small. Let me know how your next presentation goes. Best wishes! Great Information. I get really nervous before a presentation but I find that if I dress well, do my hair and makeup and look my best it really boosts my confidence.